Few novels have had the sustained impact on American culture of Harper Lee’s To Kill a Mockingbird. One of the most widely read works of American fiction, and perhaps one of the most beloved, it reached the 50th anniversary of its publication this summer. The novel has sold over 30 million copies in at least 40 languages, and between 50 and 70 percent of U.S. school systems continue to require students to read it. Why does To Kill a Mockingbird continue to enthrall us? Perhaps because it presents complex social, ethical, and moral issues in a beguilingly simple, beautifully narrated form. This tale of Southern white children coming of age amid racism, violence, and various forms of abuse introduces these issues in a manner that all readers, even the very young, recognize as simplistic; in fact Harper Lee’s first-person narrator, simultaneously knowledgeable and naïve, is one of her most compelling achievements. Jem and Scout Finch learn rudimentary lessons about courage and tolerance as they discover the ugliness just beneath the surface of their small Alabama town, and the message that most of us were enjoined to draw from the work when we were teenagers—that we must all learn to see things from another’s point of view—is the very one that Atticus Finch delivers to his children when they encounter situations or behaviors that are difficult to comprehend. Judging from the many editorials, Web sites, and panel discussions that celebrated this American classic this summer, that message continues to circulate today. But such a message, while perhaps suitable for adolescents, is dangerously incomplete and unworthy of the complexity of Lee’s masterpiece. When embraced by adults it justifies abuses just as injurious as the intolerance and racial bigotry that the novel condemns. That’s because it suggests that good will is all that we require to understand how history and circumstances have created our and others’ identities, and that once we have acknowledged the problem, it’s halfway solved. So while To Kill a Mockingbird is a story about children, it’s also a story about the limits of children’s understanding of complex social issues. It’s noteworthy that when Atticus addresses the question of identifying with others he uses two different metaphors to make his point. On the one hand, he tells his children to try to stand in someone else’s shoes and consider the world from that perspective; and on the other hand he urges them to climb into someone else’s skin and walk around in it. Those folksy metaphors for understanding human identity and perspective appear equivalent, but the difference between them is the distinction between juvenile and adult understandings of the world. Trying on someone else’s shoes is child’s play. Everyone has done that, and it’s a diversion with no consequences, much like the role-playing games the Finch children and their friend Dill enjoy on the front lawn. But climbing into someone else’s skin is quite another matter—it’s impossible. Atticus’s two metaphors are structured to underscore the difference between sympathizing with someone and appropriating his or her values, dreams, history, and experiences. The simple fact is that we cannot get into someone else’s skin, and it’s presumptuous and condescending to believe that we can. That’s something that Tom Robinson and Boo Radley know implicitly, and that the Finch children never fully comprehend. Our nostalgia for the heartwarming message we took away from To Kill a Mockingbird in high school protects us from the harsh reality that history and experience can make people irreconcilably different. It also relieves us of the responsibility of examining our own attitudes and beliefs about others, and it allows us the illusion that everyone is just like us—and strikingly, the Finch children are fond of referring to “ordinary folks like us.” That’s an illusion that can easily invalidate others’ distinct identities. Metaphor is one of literature’s fundamental tools. It shows us not so much how particular things are alike, but how we can make them alike and how we establish the grounds that allow us to perceive similarity in the first place. To Kill a Mockingbird’s title metaphor illustrates the ways we often make others little more than slightly exotic versions of ourselves. 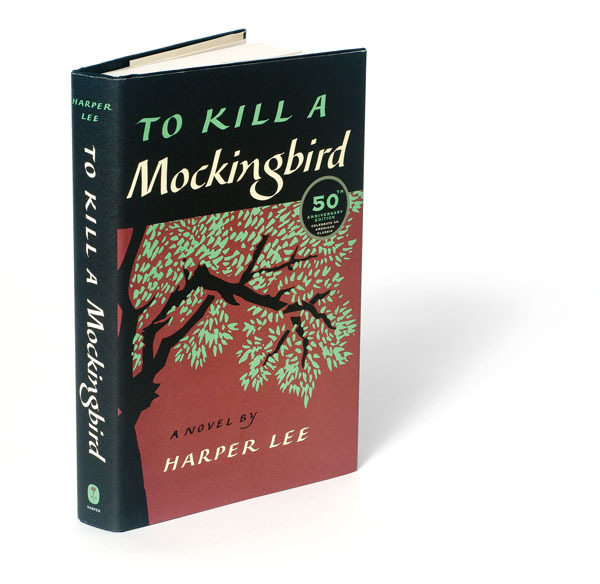 Atticus explains, in the work’s most often cited phrase, that mockingbirds “don’t do one thing but make music for us to enjoy,” and that’s why it’s a sin to kill them. But we recall that mockingbirds imitate the calls of other birds; they don’t sing their own songs. When we presume easy identification with other people, we assume that, like mockingbirds, they will sing our song, conform to our worldview, abandon their own unique voices, and sing in unison along with us—all for us to enjoy. 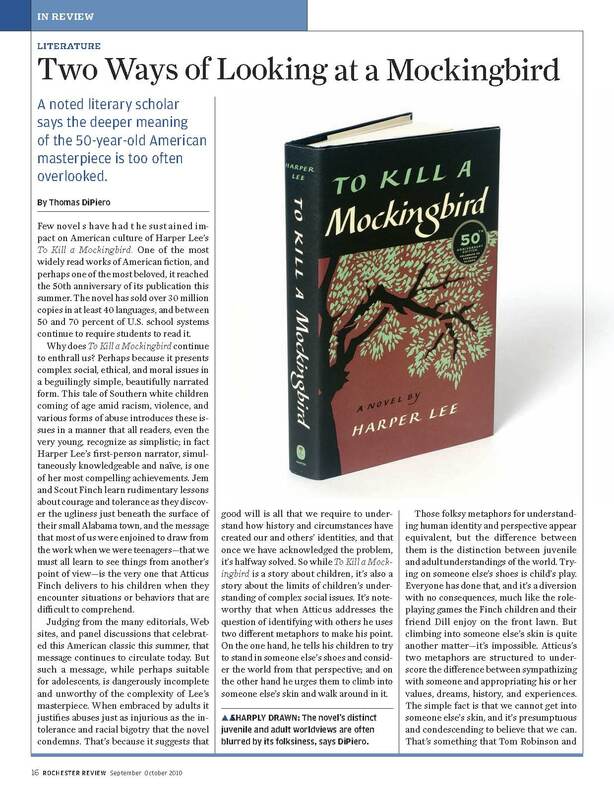 To Kill a Mockingbird has endured as a complex literary phenomenon for half a century in part because it establishes a tension separating simplistic views of Americans’ relationships with one another and sophisticated understandings of our history and culture. The challenge in reading this great American novel is not to be beguiled by its form. Remember that it’s precisely when you think you’ve understood others’ perspectives that you must recall you are not in their skin. A lifetime of experience is not assumable. We’re arrogant—and we’re drawing on a learned ignorance that adults cannot afford—when we claim otherwise. We must learn the difference between understanding others and imposing our views on them. That’s a lesson worthy of this masterpiece of American literature. And it’s not kids’ stuff. DiPiero is a professor of French and the senior associate dean of humanities in the School of Arts and Sciences.